The tour starts from the capital city of Santorini, Fira, located at the centre of the island, 8km south from Santorini Airport. 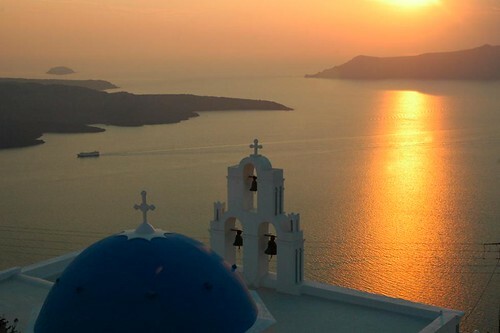 It is the epicenter of interest every summer, when tourists flock to the island to spend their vacation in Santorini. Fira is a very well developed tourist resort, featuring stunning hotels, restaurants and bars and a lovely marina for yachts that used to be the old port. The capital is known for the beautiful vies to the volcano, enjoyed by romantics of all ages, sited in a bar-café or at benches along the suspended rock. If you visit Fira, you should visit the Archaeological Museum of Thira, where you can admire a vast collection of Cycladic Artefacts, discovered on the island during the numerous excavations. The most interesting part of Fira is Nea Kammeni, where you can see and actually step on the volcano. You will leave your car hire and will board on the small boat that will take you to the island of Nea Kammeni. Leaving Fira, and driving to the south, you will pass by Karterados village and will go to Messaria, one of the largest villages of the island, with 1100 residents. Messaria is known for its wineries and is worth visiting some of them. Wine lovers visit the island and with a Santorini car hire as their ally wander around the wineries scattered in South Santorini. Down the road, you will find several nice settlements: Vothonas, Ekso Gonia, Emporio. At the south-eastern part of Santorini lies Perissa, one of the largest tourist resorts of the island. You can visit it to swim, or to taste some of the traditional flavours of the island. Exactly on the south part, you can see, one of the quietest beaches of the island, Perivolos. South of Akrotiri lie two of the most renowned beaches of the island: Vlyhada and the Red Beach, major destinations for visitors of the island. Above the beaches, on the rock, you can see hundreds of ca hire or scooter rentals, left there by the swimmers who flock the south part of the island to admire its beauties and swim in its warm waters. 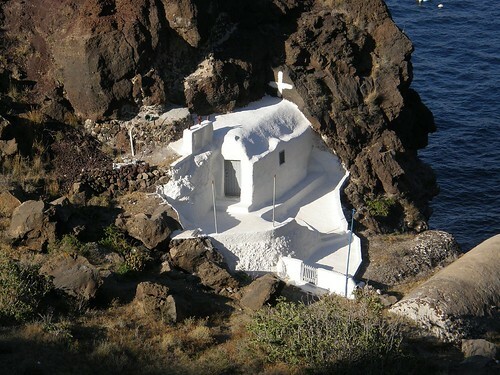 South Santorini invites you to discover it; take your bottles of waters, put on your swimming suits and ride one of the Santorini Car hire in order to wander around in one of the most beautiful settings in the world.